Located in the heart of Virginia, Appomattox County has a total area of 335 square miles. The town of Appomattox, the county seat, enjoys the timeless, charming appeal of small town America. Historic Main Street is home to a variety of shops, restaurants, coffee shop, and works of local artisans. 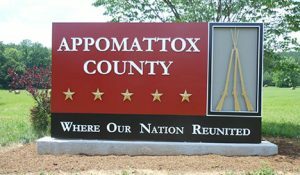 Appomattox County has a long and proud history. 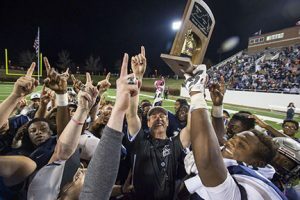 For more than 150 years, Appomattox has been known as the place where the nation reunited. As a result, tourism is big business here. A 4.5 mile wooded and scenic trail winds through the park. Toward the end, the trail crosses creeks and runs along the scenic Appomattox River. The Sweeney Prizery, the oldest building on park grounds, is located near the trail. The American Civil War Museum records the closing days of the war through 400 artifacts, photographs and documents. The museum’s “When Johnny Came Marching Home” exhibition uses the museum’s collection of objects, photographs, and documents to tell the story of Confederate veterans in the postwar South. The Carver Price Legacy Museum details Appomattox’s journey from civil war to civil rights. The Museum of the Confederacy in the town of Appomattox showcases Civil War artifacts, as well as photos, letters, and diaries. 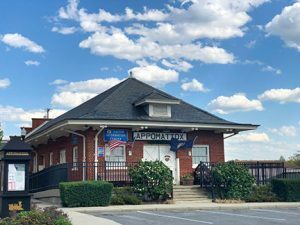 Appomattox County Historical Museum and Library, the former Appomattox city jail, offers tours and displays of Civil War artifacts. Outside is Memorial Park that honors the dead from the Civil War to Vietnam. Nearby is the Clover Hill Village Museum. of the Region’s Teachers of the Year have been from Appomattox. Wolfbane Productions provides visitors and residents alike with Broadway-style outdoor entertainment. This company of passionate artists provides unique theater through unconventionally engaging theatrical works, two of which are performed at the historic park. The company also hosts a ghost tour at the Old Crawford Farm, named the most haunted location in Virginia and listed in the top 25 most haunted in the nation. Holliday Lake State Park is a delight for the outdoor enthusiast. Fishing for largemouth bass, yellow perch, crappie and bluegill is a popular sport in the 150-acre lake. Swimming at the park’s guarded beach and the “Critter Hole” play area are visitor favorites. The park has several hiking trails, including a connector trail to the 10.2-mile Carter Taylor Multi-Use Trail for hikers, bicyclists and horseback riders. 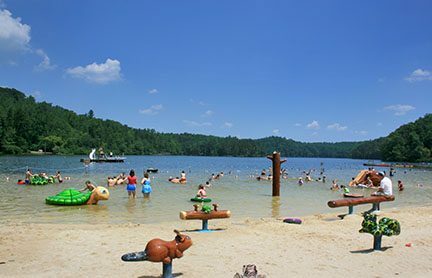 Campgrounds, picnic shelters, playgrounds, seasonal concession stand, gift shop, and boat ramp are available. The park rents canoes, kayaks, jon boats, stand-up paddleboards, and paddle boats. The Appomattox River, a tributary of the James River, is a popular destination for whitewater rafting and canoeing. Visitors enjoy golfing, hiking, biking as well as a visit to a charming lavender farm. Good food and Virginia wine conclude a fun-filled day in Appomattox. Bed and breakfasts, hotels, and campgrounds provide comfortable accommodations. 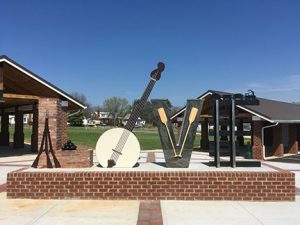 The LOVE statue in Appomattox illustrates the county’s history. The Clover Hill Village Wine Festival and the Appomattox Oyster and Seafood Festival offer food, local wines, craft beer, and live music. The Appomattox Vintage and Artisan Spring Market showcases the works of local artisans, and Appomattox Friday Cheerz is held throughout the spring and summer. 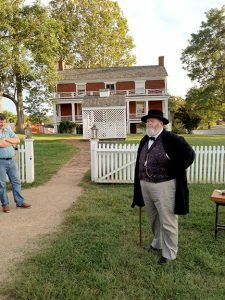 Each year, the Appomattox Court House National Historical Park and the American Civil War Museum offer visitors the opportunity to observe the end of the Civil War anniversary with programs and demonstrations. Cost of living is affordable, and public and private schools provide innovative educational opportunities. Industry flourishes in the county with companies such as Tritech Solutions and Virginia Metal Fab, which offer the local, skilled workforce opportunities to work in a high-production environment.